One of the leading local brand in the Philippines has just announced theirs new member of Omega lineup of smartphones, the Cherry Mobile Omega Infinity. The new handset sports a 5.5-inch display, aluminum finish, powered by an 1.7GHz octa-core processor, 2GB of Ram and 32GB internal storage. The device also packed with 18 megapixel w/ LED flash rear camera and 8 megapixel front-camera, it runs android 4.2 Jellybean. 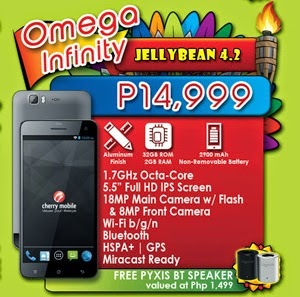 The Cherry Mobile Omega Infinity cost Php14,999 and comes with a free Pyxis Bluetooth speaker valued at Php1,499.